Nautical by Nature: Shopping Bags as art! I read multiple blog posts and there was a pretty major debate about whether this was just another way to show off wealth OR a legit art substitute. Well I decided that in a dressing area/bathroom/bedroom this would be ok. I wouldn't put the bags up in a living room, dining room, etc. But the bags I had saved over the years were just too pretty to throw away! When I moved into my apartment this past summer I framed my bags! When I saw that one of my favorite bloggers, Lisagh from Grosgrain Garage did the same thing I knew I had made the right choice! I just got a Vineyard Vines bag framed so the collection is growing! I took these with the flash off (colors are brighter in person)-I hate that the pink looks red! I would like to add a couple more in the hallway between my bedroom and bathroom (where my closet is). I really wanted to do all on 1 wall but I just don't have room (except for over my bed and I live in an earthquake area so glass above my head is a no-go!). I've been wanting to display my favorite shopping bags for the longest time. This is the perfect way!! So creative! This is such a great decorating idea! I love it! For so long, I have horded shopping bags that were just too cute to give away. Moving into a new apartment next week, and I definitely might use this idea. Adorable! Cute! And I agree... a great little touch for a bedroom/bathroom/dressing area! Kate, I think they look fantastic. And not pretentious at all. Too cute! I'll have to try and find some place to frame some cute shopping bags. The really heavy nice ones often are great quality and definitely works of art! LOVE Kate spade ones...I have a cute green/gold/white striped one that I'm in love with...maybe more than the purse that was inside the bag! You continue to be a source of inspiration. LOVE this idea. Which is the anchor bag? VV? Did you frame them yourself or have them framed? I will be copying this idea. Brilliant! I think that is such a cute idea! I used to cut bags up and use them as drawer liners, covered with clear contact paper. @garden state prep, that's another good idea. 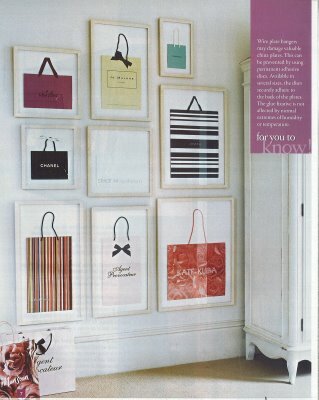 I may do that w/ very large Ferragamo bags that I've saved. The really heavy nice ones often are great quality and definitely works of art! Tickled Pink...in Rehoboth Beach, DE? I was down there last summer, SUCH a cute little Lilly store + more fun goodies! Though I'm a bit sad I didn't get the store's signature bag (very cute), but a Lilly bag instead. Not that the Lilly shopping bags aren't equally pretty. I love this idea though, and seems like the perfect way to fill up some empty wall space in my room!